La Tomatina is held on on the last Wednesday of August in Buñol, Spain. The origin of the largest food fight in the world is unclear. The theories of how it began in 1945 include a food fight among friends that escalated, an angry man who fell off of a parade float picked a fight with the crowd and they defended themselves with tomatoes, or an overturned tomato truck which turned into a food fight. Regardless of how it began, the people of Buñol enjoyed it so much that it became a yearly tradition called the Tomatina Festival. The Tomatina begins with people attempting to climb a greased wooden pole with a ham on top. When someone reaches the ham, the event begins. Trucks full of tomatoes roll into the small town and the tomato throwing gets underway. 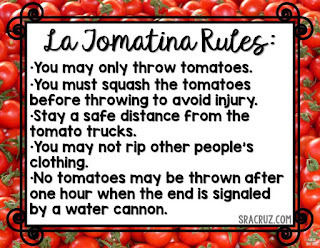 Did you know there are rules for the Tomatina? 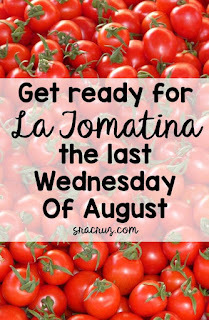 There are lots of great photographs and video clips of the Tomatina. I compiled the the background information, photos, and video clips for students in a Tomatina PowerPoint Presentation with English and Spanish versions. 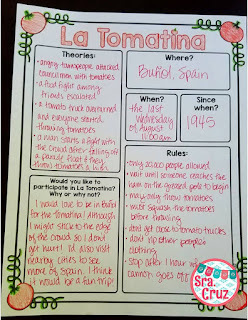 I also created an infographic template for students to take notes or research the Tomatina. I'm not sure I'll ever be brave enough to take part in the Tomatina, but it is definitely fascinating to see others having so much fun getting pelted by and covered in tomatoes! 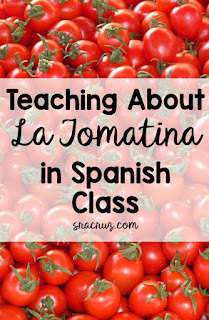 I hope your students will love learning about the Tomatina! When I wrote about Hispanic Heritage Month, I said that it can be overwhelming because it lasts an entire month. Well Día de los Muertos can also be overwhelming because it's only two days and there are so many ideas! 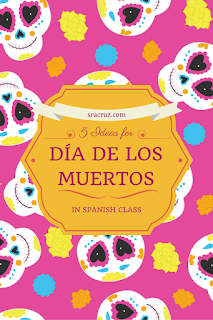 I'm going to try to help you narrow down the options with 5 great ideas to teach and celebrate Día de los Muertos in Spanish class. This is one that you can definitely do ahead of time. 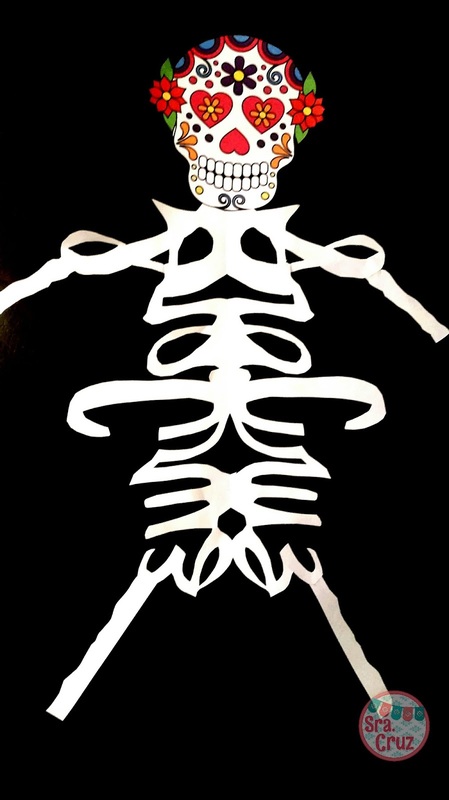 Decorating your classroom for Día de los Muertos a week or two ahead of time can pique your students' interests about what's to come. Plus, the colors and symbols of Día de los Muertos are all so beautiful, I want to have them up for as long as I can! It seems like there's Day of the Dead stuff everywhere this year! 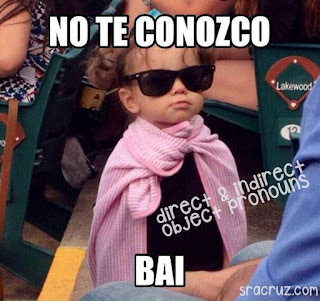 I've seen decorations, costumes, and goodies at Walmart, Target, Walgreens, CVS, and Party City. You can also use my fun banner or bulletin board for inexpensive and educational décor. I also created this tabbed mini book to accompany the PowerPoint. Students can fill in the important facts and symbols of Día de los Muertos while viewing the PowerPoint. I think one of the best ways for students to demonstrate the true meaning of Día de los Muertos is to create an ofrenda. I like to give students the choice of making an ofrenda for someone they knew, a pet, or they can choose a celebrity or fictional character from a movie or book if they'd like. 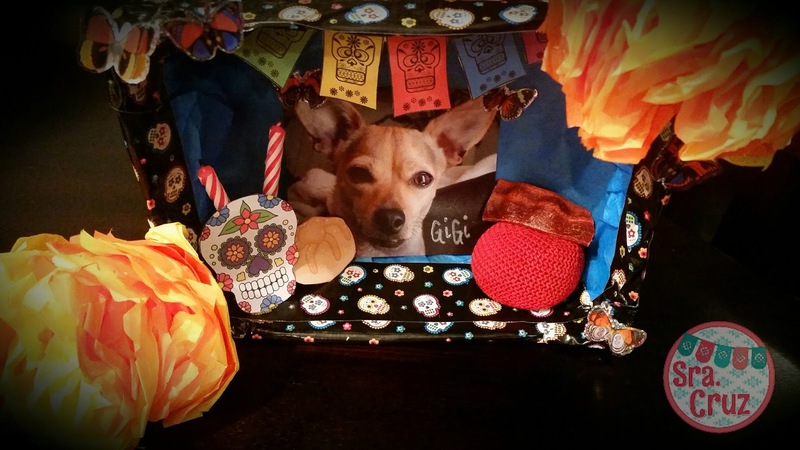 Making a large ofrenda can be time-consuming and expensive. In the past I have given students the option to make a shoe box sized ofrenda. This keeps the scale and cost lower. Here's an example of a shoe box ofrenda that I created for my sweet Chihuahua who passed away two years ago. If you'd rather not have to spend the time or money creating at 3D ofrenda, you can have students make a mini ofrenda. These are great because they capture the same significance of the ofrenda but without the expense, time, and sometimes mess of a larger ofrenda. 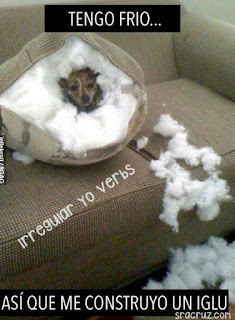 Another great thing about the mini ofrendas is that they give students the chance to use Spanish (or they can be completed in English for beginner classes). 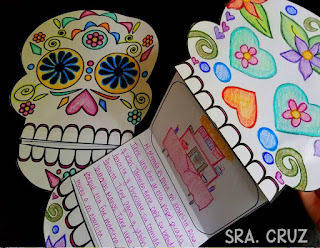 For the mini ofrenda, students write the person's name at the top of the template using papel picado. They attach a photo in the picture frame and then write the person's birth and death dates or age in the candle. In the marigolds, they write nouns and adjectives to describe them. In the monarch butterfly, they write things that the person liked. 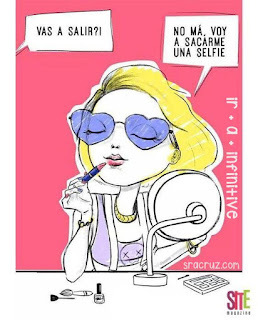 They write and illustrate the person's favorite foods and drinks in the pan de muerto. These would represent the personal items that you would normally include in a 3D ofrenda. 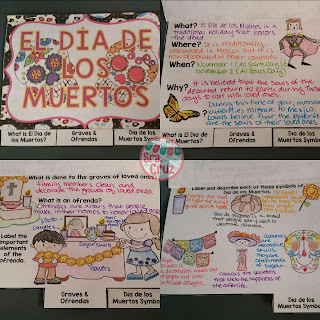 You can choose to have students present their ofrenda and they make a great display on a bulletin board, in the hallway, or around the classroom. 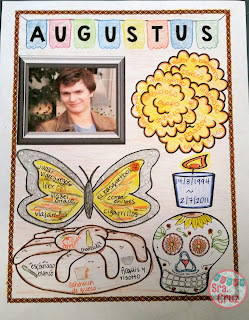 These two examples are for my dog GiGi again and for Augustus Waters from the novel and movie The Fault in Our Stars. You can find the template, directions, and examples for the mini ofrenda here. 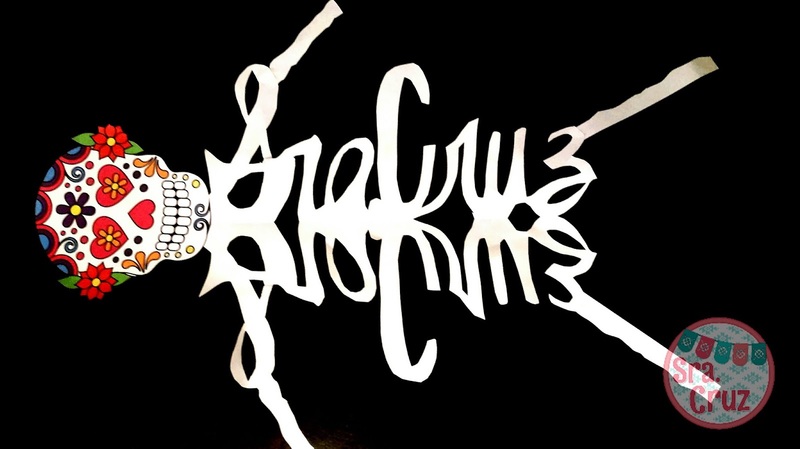 These name skeletons are another fun craft to make for Día de los Muertos. Now in case you don't see the name part, here's a sideways picture to help. -Fold a sheet of paper lengthwise. 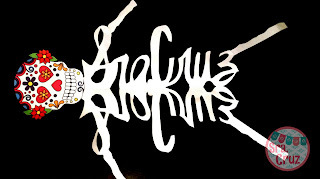 -Use a yellow marker to write your name in cursive in thick letters. The bottom of the letters should touch the fold. -Cut out the outsides of the letters and the insides of the letters like I did with the S, a, z. -At the fold, cut enough of the bottom part of the letters so that you can make out the letters but don't cut too much so that the two halves separate. 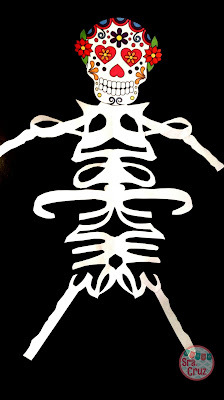 -Open the paper to reveal your name skeleton torso! -You can use the scraps to cut out legs, arms, etc. -For the head, you can have students make their own calavera skull and decorate it to fit their personality. You can also give them a template to use. 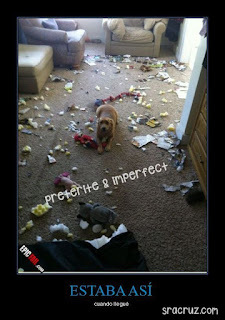 -Glue all of the parts together and that's it! I've pinned lots of other ideas, crafts, videos, photos, recipes, and other Día de los Muertos resources on Pinterest. 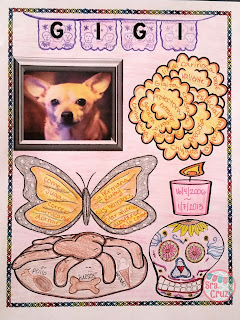 Check out my Día de los Muertos board here. I'd love to see how your shoe box ofrendas, mini ofrendas, bulletin boards, name skeletons, paper flowers, etc. 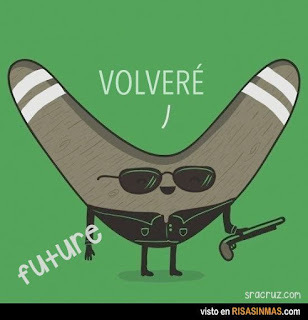 turn out! You can email me or share on instagram. Make sure you tag me or comment that you posted so I can be sure to see it! I hope you and your students have a fun Día de los Muertos! I've talked before about my love for all things memes! 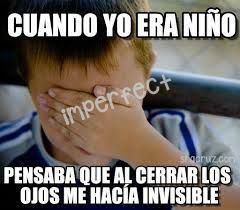 I have a ton of them saved on my Jajaja and Teacher Memes boards on Pinterest. 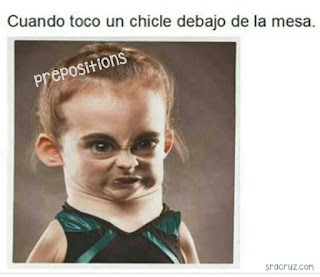 I decided to organize them by verb tenses and themes so that I can easily find the memes I need for specific verb tenses. These are fun to use as warmups, conversation starters, on your notes or PowerPoints, or on quizzes and tests to give students a little giggle. Click on each image below to find the corresponding Pinterest board. 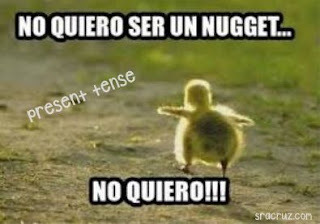 I will be adding more as I find more memes for each tense. I hope you enjoy these memes! You can find all of my Pinterest boards by clicking the image below. Hispanic Heritage Month will be here soon! 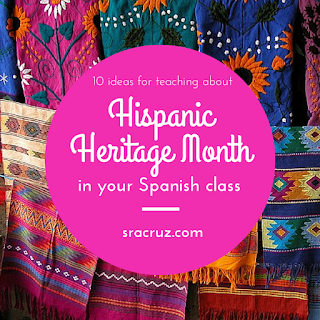 The great thing about HHM is that it gives you a whole month to teach about it. That can make it a bit intimidating too! 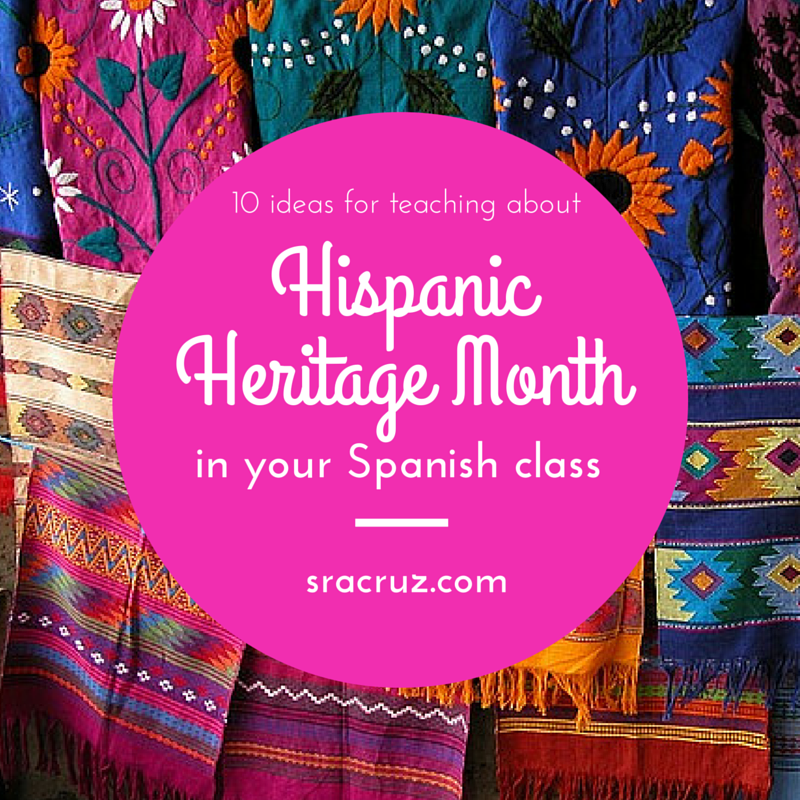 I wanted to provide you with 10 ways to teach and celebrate Hispanic Heritage Month in your Spanish class. 1. 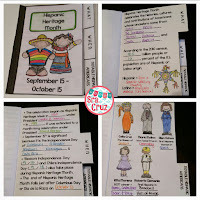 What is Hispanic Heritage Month? Before you can celebrate HHM, students have to know what it is! 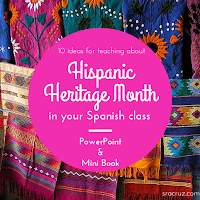 I do this with a short PowerPoint presentation that tells about HHM being a celebration of the histories, cultures, and contributions of Americans with Hispanic heritage, how HHM began, and the significance of the dates during September 15 - October 15. 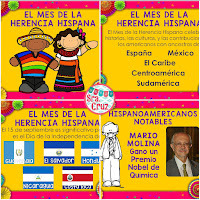 I also mention that HHM honors Hispanic Americans who have made significant contributions to the world in areas such as science, medicine, art, literature, music, film, etc. Students make these mini books to take notes and organize the information from the PPT. You can find the PPT and Mini Book here. 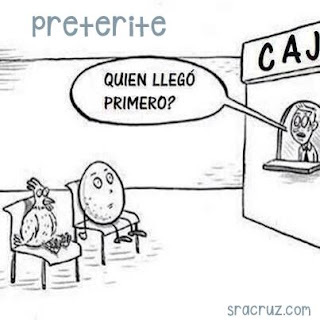 I have both an English and Spanish version of each so that you can use it for beginner and upper levels. My students always loved anything related to food! A fun way to celebrate Hispanic Heritage Month is to bring in samples of authentic Hispanic recipes for students to try. It doesn't have to be a huge potluck or anything crazy, but just enough for each student to get a taste of a food they may not have tried before. 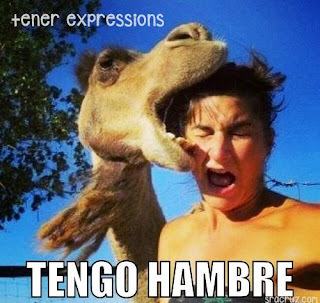 For example, each Friday of HHM you could make arepas, patacones, pupusas, horchata, buñuelos, etc. 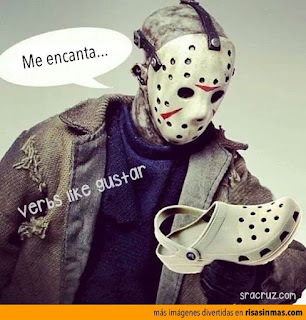 and have students try them. If you have any students of Hispanic heritage in your classes, you could also ask if they'd like to bring in a family recipe for their class to taste. 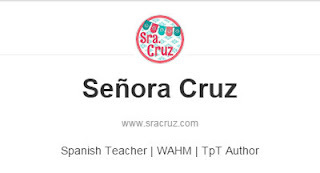 If you live in a larger city, you could also provide students with a list of restaurants and stores where they can find authentic Hispanic foods. For more recipe ideas, you can check out my Recipes board on Pinterest. Similar to my Cultura Diaria, I wanted to create a daily resource for Hispanic Heritage Month. 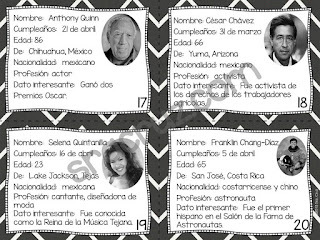 I put together a calendar of notable Hispanic Americans for each school day of Hispanic Heritage Month. 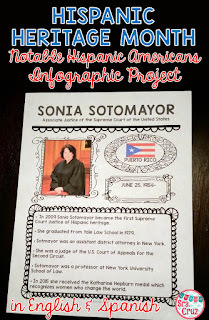 Each day has a notable Hispanic American, their photo, something they are known for (Spanish and English versions), and a link to a short video clip about them. This would make a great class starter or warmup during HHM. I even included coordinating bulletin board headers in case you wanted to print out the pages for a bulletin board or hallway display for HHM. You can find more info about this resource here. 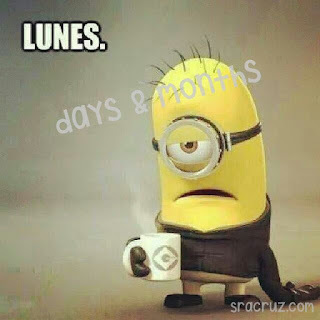 Similar to the Hispanic Heritage Month Food Fridays, you could make Tuesdays "Muestra martes." You could start by bringing in cultural items from your collection for students to see. 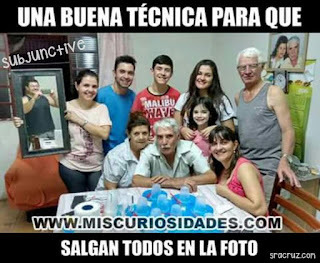 Then any students who have traveled to Spanish-speaking countries or who have any cultural photos or items of their own could bring them in to briefly share with their class. 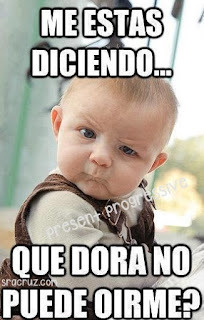 Depending on your students' level of Spanish, you could choose to have them present in English or in Spanish. An important part of Hispanic Heritage Month is recognizing the contributions of Hispanic Americans. Students can research notable Hispanic Americans and complete a report about them. I like to use this simple infographic project. Students give the person's name, title or profession, their Hispanic country of origin, and list their accomplishments and awards. 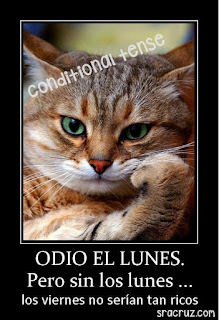 It can be completed in English or Spanish. It can also be completed by hand or digitally. 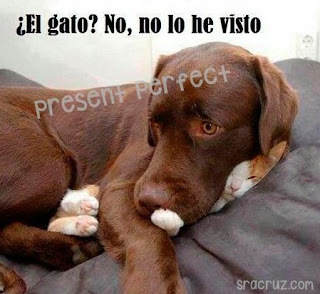 In addition, you can choose to have students present about their person in Spanish. These completed projects can make a great bulletin board or hallway display. 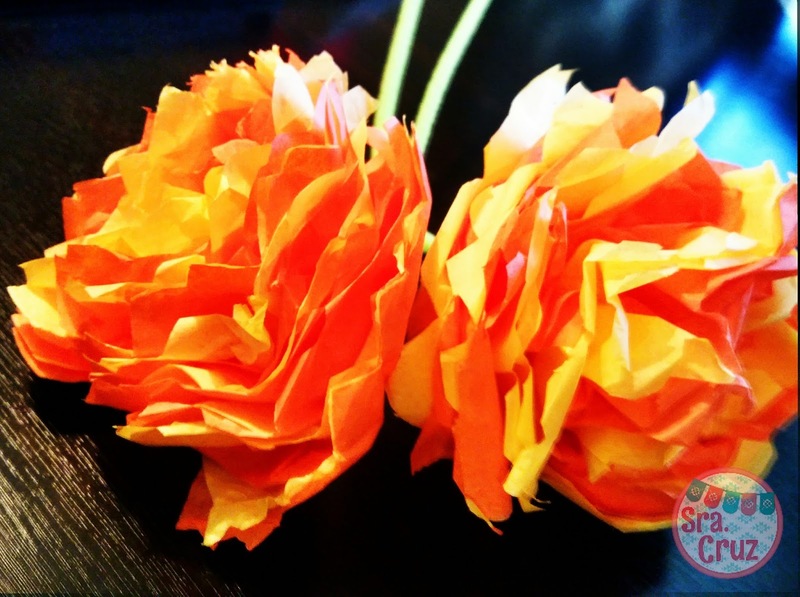 Crafts can be fun and educational! You can explain the history behind a craft and have students present or write in Spanish about their craft to add educational elements to any traditional Hispanic crafts. There are so many wonderful craft ideas you can choose from. I put together a Pinterest board with lots of Hispanic Art projects ideas that you can use in your classes. A great indicator of the influence of Hispanic Americans is that Spanish and Hispanic cultural influences are all around us. 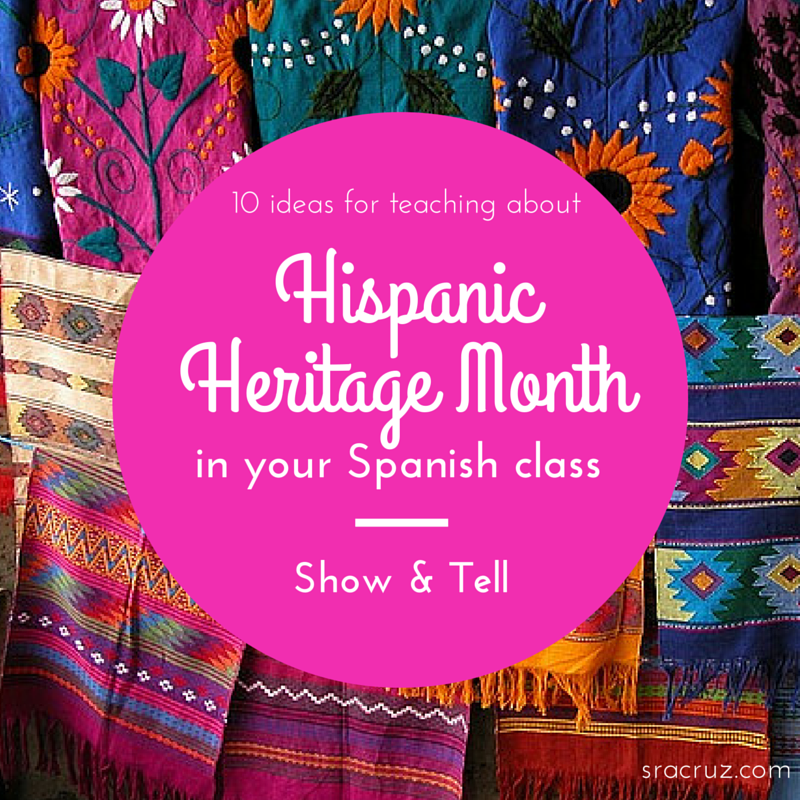 You can challenge your students to bring in photos or examples of the influence of Spanish language or Hispanic culture. 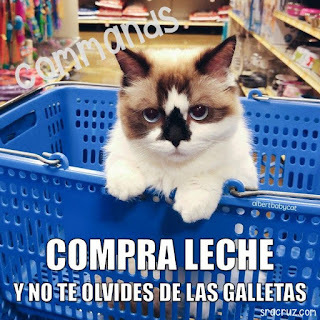 These may be signs in Spanish, images from Spanish-speaking countries in advertisements, Spanish in song lyrics, etc. You could use the last few minutes of each class for students to show their examples, and you can even have a challenge to see which class can bring in the most examples. 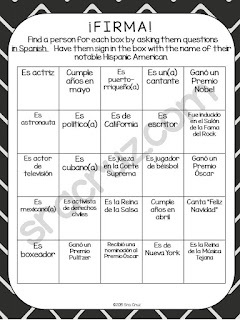 You can create a bulletin board or have a poster board for each class. 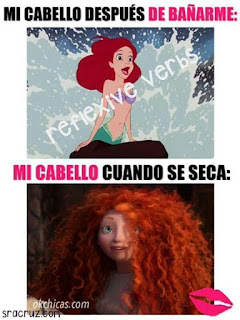 You can expand on these by analyzing the spelling of signs, pronunciation of Spanish, etc. 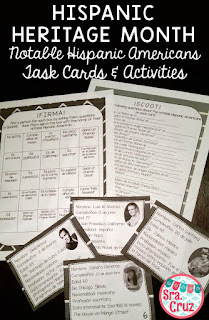 In the spirit of recognizing influential Hispanic Americans, you and your students can use HHM as an opportunity to talk about the influential Hispanics in your own lives. 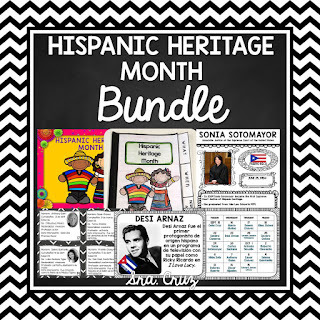 You can present students with the task of talking or writing about a person of Hispanic origin who has been an influence in their lives. It can be a neighbor, family friend, teacher, coach, church member, etc. You can start by telling students about someone who has been an influence in your life as an example. If you are fortunate enough to live in or around a large city with substantial Hispanic population, there will likely be some type of local Hispanic Heritage Month festivities. Googling your city or state and Hispanic Heritage Month should lead to some local festivals and celebrations. Make sure that your students know about these and hopefully they can attend and experience the food, art, music and culture that these celebrations would include. Feel free to pin any of the images in this post to save ideas for later! What activities will you be doing in your classes for Hispanic Heritage Month? Let me know in the comments below!